Following on from the sleek modern modern interpretations of the tourbillon such as the U20, U21, U22 and the U40 that have come to define Angelus’ tourbillon aesthetic, for Baselworld 2018 Angelus is now presenting its first diver’s watch, the U50 Diver Tourbillon, with the same characteristically (modern) Angelus-style skeletonised movement. As it is the key to this piece, it’s important to remember that Angelus pride themselves on their skeleton movements not being a modification of an existing non-skeletonised movement, but that they are built from the ground up in a skeleton form. The U50 Diver Tourbillon’s Calibre A-300 may look somewhat familiar to you. The manual-wind Calibre A-300 was also used for the U40 Racing Tourbillon Skeleton, in a different manifestation. Beating at 28,800 VPH, it has a power reserve of sixty hours. The movement has black ADLC coating, snailing, and chamfered edges. Wheels with exclusive Angelus six-spoke design to maximize rigidity. The mirror-polished cage of the one-minute tourbillon has chamfered and polished edges. All the movement’s main elements are secured between two plates for rigidity reasons. The same reason is behind the use of Angelus’ six-spoke design, which reinforces the wheel train and protects the skeletonised ratchet and barrel. The 45mm (12.4mm thick) titanium case features two crowns; the one at 2 o’clock is for the uni-directional 60 minute diving yellow/ blue flange ring, and the crown at 4 o’clock is for winding and setting the time. There’s also a helium escape valve at 9 o’clock. The yellow/ blue colour theme of the flange extends to the hands, which are also coated with Super-LumiNova. 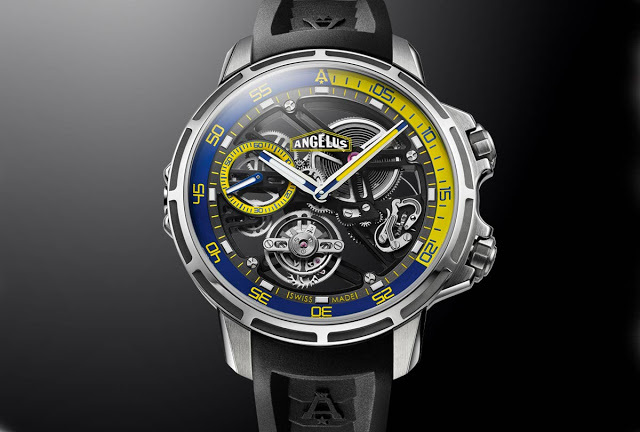 Angelus’ first diver comes on a black rubber strap with a titanium deployant and a water resistance of 300m. Its RRP is 29,700 CHF.